There are many different types of dentures. Some dentures are used to replace a few missing teeth, while other types can replace a full row of missing teeth. Further, dentures fill in the gaps where teeth are missing, restore normal tooth functioning, help support sagging muscles in the face, and correct speech that had been altered by missing teeth. A dentist can help you decide which type of dentures is right for you. At JP Dental Care, Dr. Jintae Park is your dentist for different types of dentures in Reno, NV. The different types of dentures fall into two main categories: full and partial. Full dentures are also referred to as complete dentures and are used to replace a full row of teeth when no natural teeth remain. Partial dentures are used when some natural teeth remain so only partial replacement of teeth is needed. Three main types of full dentures include immediate, conventional, and implant-supported overdentures. 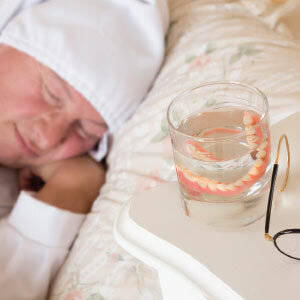 Immediate full dentures are worn temporarily while waiting for conventional full dentures to be made. Conventional full dentures are customized for an ideal look and fit. These dentures are made to perfectly fit your mouth and are meant to be worn long-term. Implant-supported overdentures are held in place by a few dental implants rather than a dental adhesive. The implants provide stability and support for the overdentures. The two main types of partial dentures are removable and transitional. Transitional partial dentures are made from plastic and are only meant to be worn temporarily while waiting to have dental implants placed. Removable partial dentures are a lightweight metal-based denture that can be worn long-term. They are also a more affordable alternative for replacing missing teeth, as compared to such tooth replacement options as dental implants or fixed bridgework. There are several different types of dentures available and a dentist can recommend which type is right for you. For dentures in Reno, NV, schedule an appointment with Dr. Park by calling JP Dental Care at (775) 853-0503.